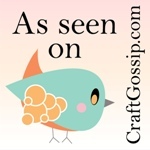 Craft Knife: Adventures in Geocaching with the Girl Scout Junior Geocacher Badge--And Beyond! 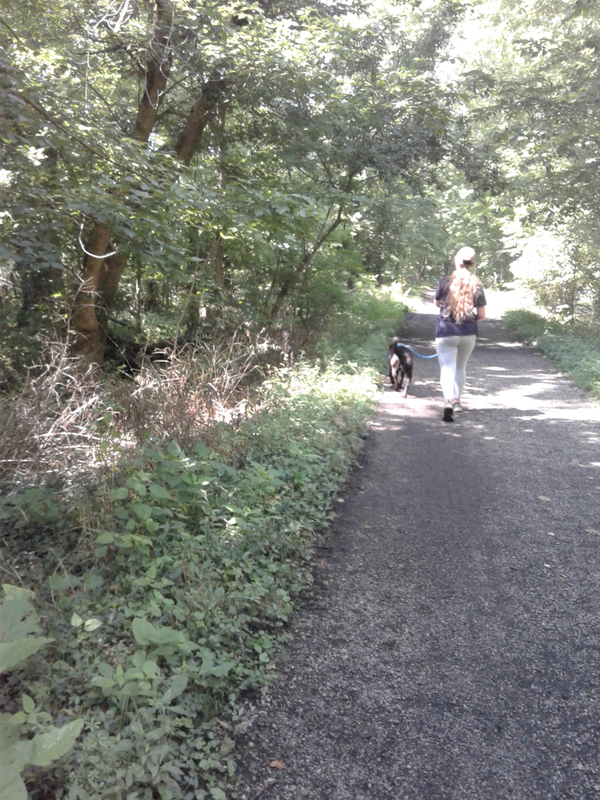 Adventures in Geocaching with the Girl Scout Junior Geocacher Badge--And Beyond! I've now taken two sets of Girl Scouts through the Junior Geocacher badge, and every time it gets more fun! This is also one of those Girl Scout badges that goes way beyond the badge, opening kids up to a new life skill and a fun new hobby. The first time we geocached, it was so that Will could earn her Junior Geocacher badge, and though the kids forget about it for months at a time sometimes, we've never really stopped geocaching in the years that have gone by between then, and Syd earning hers, and our newest crop of Juniors earning theirs. But check this out--the first time we geocached, back when Will was ten and Syd was eight, I didn't even have a smartphone! There we were using a Garmin GPS receiver that the kids' grandfather gave them, and if I wanted to be able to read the clues for each geocache, I'd have had to print them before I left. It's a LOT simpler these days, with the Geocaching app on my smartphone--when I knew I needed to take the whole troop out geocaching a few weeks ago, I even sprang for a month of the premium membership, and Friends, I think I'm going to keep it! And geocaching, I should add, is the PERFECT activity to do with kids. They are way better at finding the actual caches than I am, probably because they're closer to the ground or something, I don't know, and it's a great way to have them burn off excess energy, as you not only have to hike to the spot where the cache is hidden, but then wander all around that spot with your eagle eyes on to actually find it. It's also a great activity to do with tweens and teens. 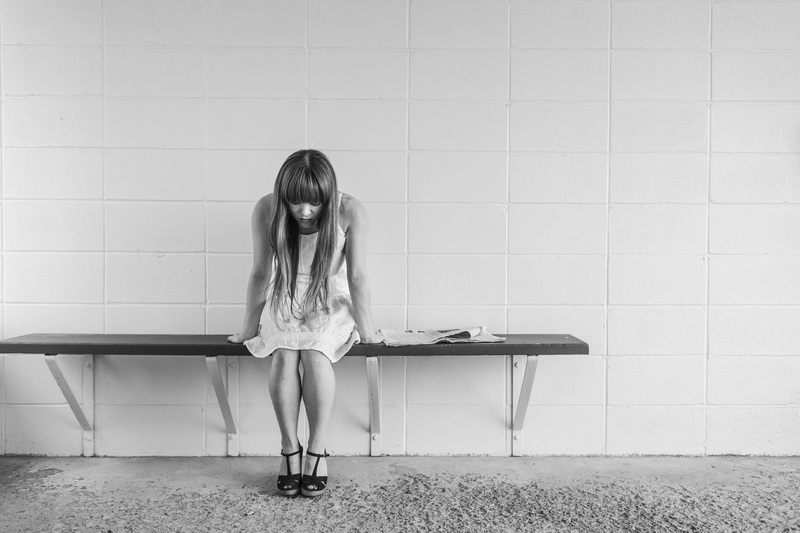 Kids this age--or at least girls, since that's who I've worked with--can start to get more squeamish, more reluctant to get dirty, more hesitant to turn over strange sticks and see what's underneath. That's a detriment to their lifelong physical activity level and to their courage and sense of adventure and stoicism and ability to enjoy nature. 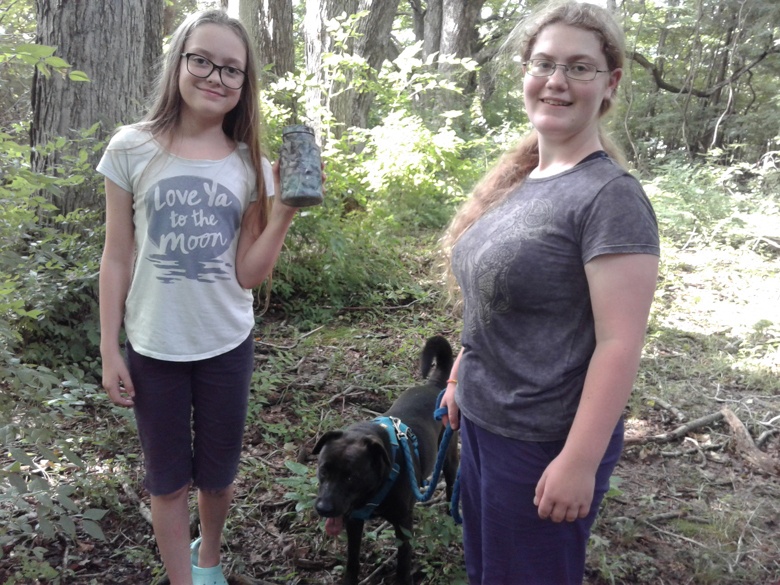 I was out on a trail hike with a group of girls recently, teaching them to geocache. Each girl in turn was the leader, in charge of the clues and the GPS receiver, but all the girls were meant to be looking for each cache. However, some of the girls were practically diving into the woods to look, wading through the underbrush and turning over sticks, getting wet and muddy, while other girls were "looking" by standing on the trail and sort of gazing around helplessly. After a few caches had been discovered, a couple of the stand-and-gazers complained that the same girls were always finding the caches. It was true, and so I pointed out to them that they should observe those girls who were always finding the caches. Where were those girls right now? Off in the underbrush, squatting to examine rocks and poking around the bases of trees. Where were the girls who weren't finding any caches? Standing right there and not committing to the search. At our next geocache stop, I observed that every girl was engaged in the activity--yay! After all, I told them, you don't know that you even had fun if you don't come home dirty, sweaty, and with one to three small injuries! We get sweaty and dirty and always come home with at LEAST one to three small injuries, but that's a small price to pay for the experience of finding and then rehiding treasures, like this Mason jar covered in camo duct tape! Here, then, are a couple of my pro tips for geocaching with kids--Junior Girl Scouts, especially, because those are my specialty, but really just any kids. Check out the activity log for the geocache before you begin. You'll see this in the Geocaching app, and you'll want to click on it to see a timeline of who's searched for that particular cache and found it vs. who's searched for it and hasn't. Warning signs consist of either no recent activity or recent activity in which the cache has been marked "DNF" (Did Not Find). You don't have to abandon this cache before you begin if you see these warning signs, but you should at least point them out to the kids, tell them to manage their expectations, and set a time limit for hunting for the cache before you, too, mark it "DNF." Privilege the caches that involve a nice walk or some nature activity vs. the "quick grab" caches. The latter are fine, especially if you're already in the area, but kids are less amenable to getting in and out of the car over and over if you're making an afternoon of geocaching, and in my mind, the more nature and the more physical activity the better--hence my preference of the nice walk outdoors over the hopping in and out of the car. Kids don't realize what good a walk in the outdoors does to their mood, and the more chances they have to get distracted by trees and wildlife and the beautiful environment, the more chances they have to associate being outside and active with feeling happy and well. Try travel bugs. They're not always successful, but if they do take off, then it's absolutely thrilling to a kid to follow their journeys. I bought this set of travel bugs for my Girl Scout troop, and they're perfect. Make your swag by hand, and always have it with you. Not all geocaches have swag containers, but the ones that do are always the most fun for the kids! 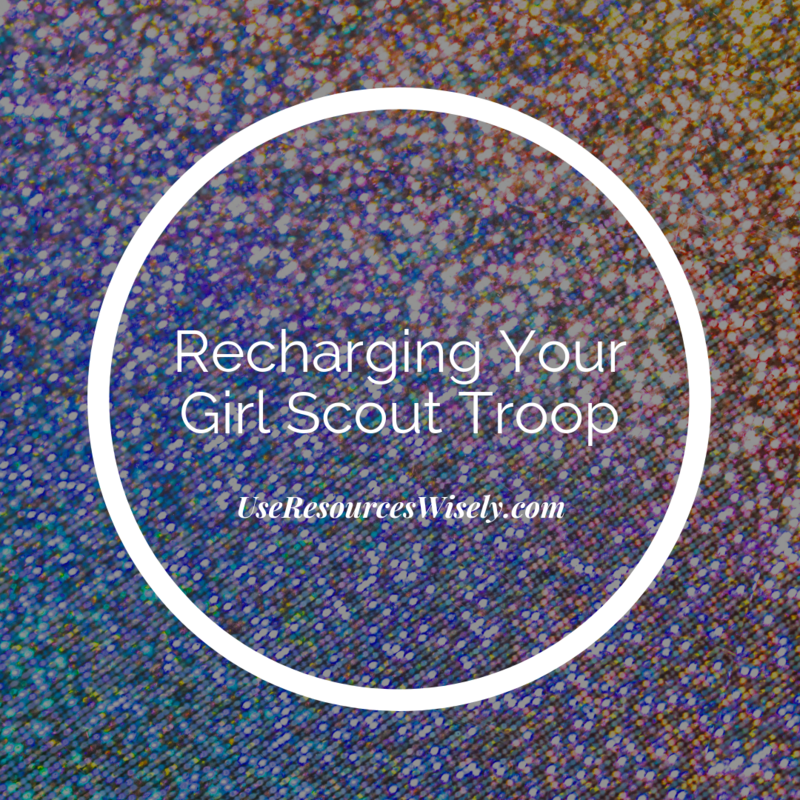 Shrinky dinks and painted rocks make awesome swag, in my opinion, but when I've earned the Junior Geocacher badge with a troop, I've encouraged the girls to make Girl Scout SWAPS for it. Hand-stamped dog tags with cute geocaching-themed phrases on them would also be treasured by their finders. If you don't have a smartphone, try letterboxing. It's a LOT more old-school than geocaching, and so a lot of letterboxes have gone dormant, but many are still around, and there are still some good communities for it. Additionally, it's still a Girl Scout Brownie badge, so if there's a Brownie troop near you, then kids are for sure letterboxing! If it's possible to bring a dog, then bring a dog! 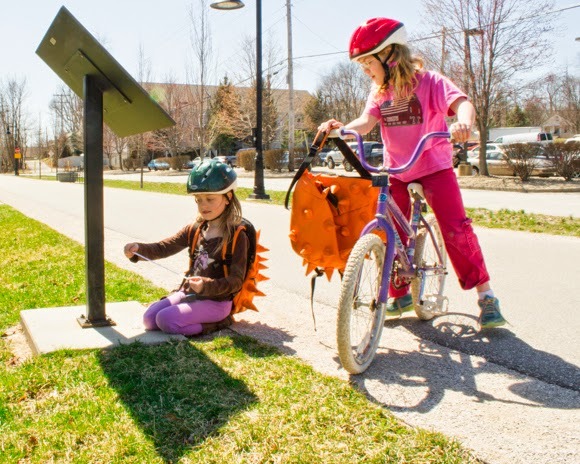 Now, here are some geocaching activities that the kids and I are still hoping to try! We've never geocached while we've traveled before. Most of our upcoming road trip will be just me and the girls, and I'm hoping that we'll find plenty of free time to try geocaching. Perhaps on the nights when we get to our motel at a reasonable time, we can have an after-dinner adventure! Travel bugs aren't super spendy, but the cost adds up, especially when most of them get absconded with by some scrub out on their third ever cache. I LOVE the idea of making our own homemade travel bugs with codes that we didn't have to pay for. When we find a swag cache, I let each kid who has something to put in also take something out, which means that the kids are gradually collecting lots of little trinkets and treasures. 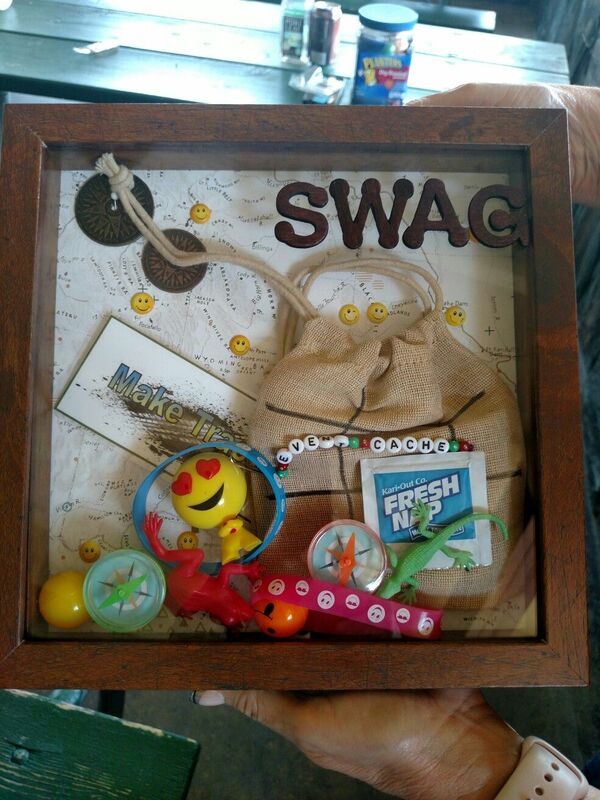 Honestly, the only thing that makes those objects NOT crap is the fact that they were found in a geocache, so wouldn't it be cute to make the kids each one of these geocaching shadow boxes to store their swag and get it out of my way? I'm going to swing for the year's premium membership to the geocaching app, which means that we'll be out and about geocaching even more, and I think I'm more excited about it than the kids. If you've got more good tips or know of any super geocaches in Nova Scotia or on Prince Edward Island, let me know. I'd freak out if I found an Anne of Green Gables-themed geocache!! !